Red Island Banyuwangi East Java is one of an attractions place in Banyuwangi located in Pesanggaran DIstrict, This Beach usually called Pantai Pulau Merah in Indonesia language. This beach is known as a small green hill red landless situated near the beach. This hill can be visited on foot at low tide. There were also temples where citizens are Hindu ceremony there Mekiyis. This tourist area is managed by Perum Perhutani Unit II East Java, South Banyuwangi KPH. 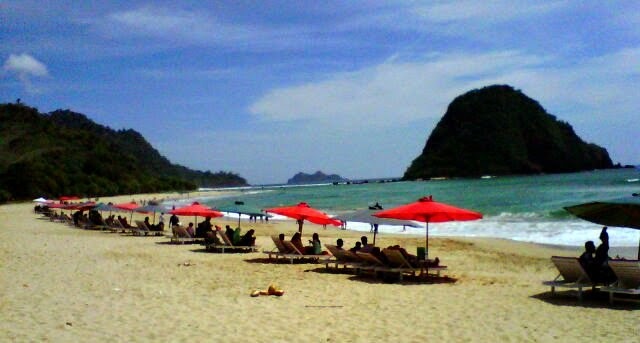 Red Island Banyuwangi located in the coastal village of Sumber Agung, District Pesanggaran, Banyuwangi. Pulau Merah in the south Banyuwangi successfully lure tourists through a shape that resembles a mountain in the middle of the beach. A blend of clarity of the water is like crystal and features white sand which extend as far as 3 km, adding to the beauty of the Red Island. In the east coast mountain range visible. The number of coconut and banana trees make the island seem fertile. While the southern part of the island, visitors can enjoy the beauty of the sunset. When the water subsides, The visitors can visit these places by on foot to enjoy the uniqueness of a small mountain at the center of the coastal soil color is red, hence the name Red Island beach Banyuwangi. At the moment it looks tidal red soil. There is also a saying called Red Island because rock ledges beaches appear colored red soil. Whereas in the beginning, this beach called Pitu Ringin Beach. Red Island Banyuwangi East Java popular with the surfing tour especially when the wave condition is hard and good wind, Most visitors most enjoy the Surfing in Red Island beach. Surfing tour in this beach very suitable for surfer beginner because the wave condition is not too hard like Plengkung beach surfing. When the Sea condition is clear and Shifting the name of Red Island Beach into Ringin Pitu is in two versions. According to the first version, because of the color of reddish soil and sand of the island as high as 200 meters. While the second version says, purportedly from the Pulau Merah which is in front of its coast within about 100 meters, was once radiated red light, so that people around eventually renamed "Red Island". Beside Red Island Beach Banyuwangi, or Red Island Coast, You can also enjoy other nature tourism around Banyuwangi Such as Ijen Crater tour package and Mount Bromo Sunrise Tour. On Ijen volcano, You will able enjoy Blue Flame Ijen Crater that always appears all night and need 2 hours trekking from parking lot (Paltuding), Sukamade beach tour that popular with its turtle egg laying and turtle release, Alas Purwo have known as historical forest of Indonesia colonial area and Papuma Beach sunrise Jember. For other nature tour package in East Java, You can read detail link itinerary below. Or You can visit Our booking form. The nearest way to reach to reach Red Island Beach Banyuwangi East Java is from Banyuwangi Port with the trip duration for 3 hours. If You start from Surabaya or Malang, The trip need 6 hours by car. Before You enjoy Red Island beach, very recommended to bring sunblock lotion or mosquito lotion in order You can make relax sunbathing under the Sunshine in the sea shore.